Kyanite is a member of the aluminosilicate subgroup of silicate minerals. It is typically blue, but its color may vary. It is used in porcelain plumbing fixtures, dinnerware, electrical insulators, and abrasives. It has also been used as a gemstone, and it is a collector's mineral. The name kyanite derives from the Greek word kyanos, meaning blue. This mineral is also known by several alternative names, including disthene, munkrudite, and cyanite. White-gray kyanite is also called rhaeticite. Kyanite is commonly found in aluminum-rich metamorphic pegmatites and sedimentary rocks. It is a diagnostic mineral of the Blueschist Facies of metamorphic rocks. Kyanite has two polymorphs: andalusite and sillimanite. Kyanite and its polymorphs have the same chemical formula, Al2SiO5, but they differ in crystalline structure. An interesting property of kyanite is that it undergoes irreversible expansion when fired at high temperature. In addition, this mineral is strongly anisotropic, in that its hardness varies depending on its crystallographic direction. Kyanite's elongated, columnar crystals are usually a good first indication of the mineral, as well as its color (when the specimen is blue). Associated minerals are useful as well, especially the presence of the polymorphs or staurolite, which occur frequently with kyanite. However, the most useful characteristic in identifying kyanite is its anisotropism. If one suspects a specimen to be kyanite, verifying that it has two distinctly different values of hardness on perpendicular axes is a key to identification. In Buckingham County, Virginia kyanite from the mine at Mt. 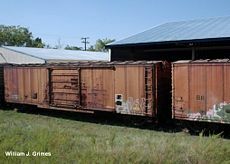 Willis is transported by train on the Buckingham Branch Railroad. Kyanite is used primarily in refractory and ceramic products, including porcelain plumbing fixtures and dinnerware. It is also used in electrical insulators and abrasives. Kyanite has also been used as a gemstone, though this use is limited by its anisotropism and perfect cleavage. 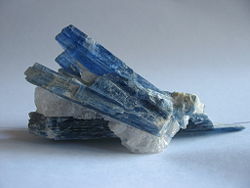 Finally, as with most minerals, kyanite is a collector's mineral. This page was last modified on 16 June 2018, at 15:28.